Wanna know how to make them? You can find the easy peasy directions over at Hungry Happenings, where I am guest posting today. Beth is out of the country on a fabulous vacation and I am thrilled to fill in! 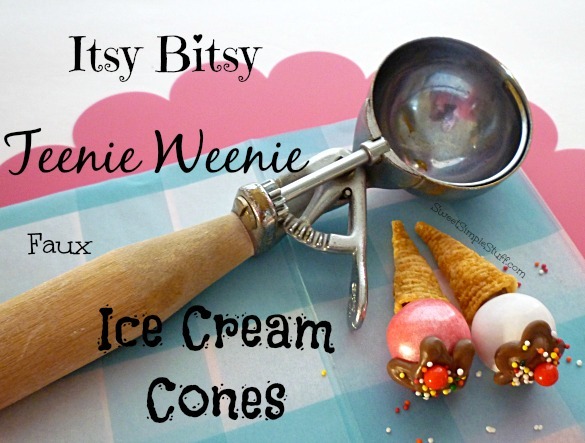 So, hop on over to Hungry Happenings and check out the directions for these faux ice cream cones and all of the other fun stuff on Beth’s website! Hello, thank you for stopping by! You are welcome to use/pin a single picture in your blog post as long as you link back to my blog properly. Please do not copy an entire post without my permission. Candy Carrots ... easy peasy!